I remember watching Branded when I was a kid-- it must have been in syndication, because I remember watching in the afternoon (and I would have been a little young for the first run). The show kind of upset me. I found the opening sequence when they snapped his sword in half disturbing. I don't think there was anybody actively pursuing him, though. I suppose you could say that he was dogged by his unjustified reputation. She could have been added to his portfolio. Ah, now that would have been interesting! It was brief, but a nice moment. With the series nearly over, I'm just now starting to warm up to Mother. Is it? It's also the last season that I have recorded Decades. It's still on Cozi, though down to two episodes a week on Saturday afternoon. On Sirius when I was driving home, the DJ played a full audio clip of Joe Friday describing an auto collision in tenths of a second from "The Hit and Run Driver". Tying it in even more with recent business here, he was using it to introduce "Dead Man's Curve"! Trying to change the ideas or lives of others through political statements (no matter the vehicle used) is...politics. That is not created to operate in an experimental vacuum, but to make changes. By influencing others, that had a natural path toward anyone who took his message to heart acting on/for political interest. This period defined him as a agent of political change for the reminder of his life. Perhaps your "Daydream Believer" sub-genre is the product of the sort of bias that you attribute to others. No, I believe the bias is in leaning on questionable categories, yet cannot acknowledge how the Monkees song had a direct influence on the songs which followed it (all cited). Its no secret that major hits often lead to numerous imitations or "inspired by" songs, so why this is not acknowledged by a hit as major as "Daydream Believer" raises questions. My friend says she cannot stand Streisand because as she claims, Streisand "sings from her nose" instead of the diaphragm, which my friend says is the "right" way. I shrug my shoulders at that one. Maybe that's why I don't like her, but just don't know enough about music to realize it. Nice. I don't think I'm familiar with Justified, unless I just don't remember-- but Mixer will remind me if I am. Oh, right, Branded, the sword-snapping one. The name just didn't catch for some reason. Wow, that was great. And pretty long for a variety show. Well, it was the season that Teresa Graves was on, so it's the pinnacle for me. Clearly I need a memory upgrade. Ouch. Don't text and drive, kids. Its no secret that major hits often lead to numerous imitations or "inspired by" songs, so why this is not acknowledged by a hit as major as "Daydream Believer" raises questions. Right down to the use of piccolo trumpet. I don't think I'm familiar with Justified, unless I just don't remember-- but Mixer will remind me if I am. I looked it up, it's a modern cable series. Ah, thanks-- definitely not familiar with it then. A gang of juvenile shoplifters steals the oddest things until Friday and Gannon discover the reason why. This is the city: Los Angeles, California. It's a big place...and getting bigger all the time. Twenty years ago, this was our telephone book. Today, it takes these five books to do the same job. People move here from all over the country, looking for a new life. Some leave their inhibitions back where they came from...and sometimes their sense of right and wrong. That's when I go to work. I carry a badge. What it boils down to is the new morality, doesn't it? A whole new sense of values. The kids see it on television...in magazines...even hear it from the pulpit. God is dead. Drug addiction is mind-expanding. Promiscuity is glamorous. How you gonna fight that? Once they're in their assignment, Pearson sends the duo to a department store that's caught a 15-year-old shoplifter named Bobby Lassin (18-year-old Mickey Sholdar). The list of items that he lifted is bafflingly eccentric...a hairdryer, diapers, paperclips...but he seems like an ordinary, clean-cut boy except for his hip clothes. Mrs. Lassin: No son of mine is gonna dress up like a circus clown! Friday and Gannon arrange to visit the school that all of the Mods attend, where the principal rounds them up in his office...but only after a customary expository lecture to the detectives about why kids join gangs and how school can't give them the things that they should be receiving at home, like lessons in basic values. There's not a Linc or a Julie among the Squad's members, and their leader is not Adam Greer, but Audie Fulton (Roger Mobley)...though Friday takes to calling him "Boy". Friday relates a cautionary anecdote about a juvenile whose case he'd handled ten years ago, who proceeded into a life of crime and is now sitting on death row. Most of the Mods look properly chastised...but Audie remains defiant. Back at the office, the detectives are sent to the same department store, where the shoplifter is now Audie. I'll go quietly--no more speeches, please! Unable to get ahold of his parents to come to the office, they go to Audie's home and meet his mother (Andrea King), who immediately gives the impression of being unconcerned and irresponsible. After they learn that the Fultons are going to Europe and not taking Audie, the detectives opt to hold him rather than release him to his parents. Mrs. Fulton: I must run, I'm late now! Following his mother's visit, Audie turns repentant with unlikely speed, expressing his appreciation that Friday took more interest in his welfare than his parents have. The petition filed by the County Probation Department was sustained, and the subject was made a ward of the Juvenile Court. Friday and Gannon investigate an apparent suicide after evidence sheds a new light on the incident. This is the city: Los Angeles, California. It's the largest city in the United States. Los Angeles has a lot of everything. People. A police administration building and sixteen geographical police divisions. North Hollywood Division. Wilshire Division. West Valley Division. Van Nuys Division. Hollywood Division. Los Angeles has one of the largest artificial harbors in the world. This is San Pedro. It has a baseball team; this is where they play, Dodger Stadium. It has a sports arena--this one'll handle ice hockey, a rodeo, a championship fight, or a national political convention. It has Hollywood, and it says so on the side of a mountain. It has golf courses, lots of 'em, public and private. You can trace the history of man, his habits, his progress, right here: the Los Angeles County Museum. A lotta people are born in Los Angeles every day...many of 'em here, at the County Hospital. A lot of people die in Los Angeles...every day. A lotta people get married. A lot get divorced. When a marriage falls apart and it happens here [Hall of Justice], it's a job for lawyers. When it doesn't, sometimes it's part of my job. I carry a badge. Tuesday, March 24 (1964): Friday and Gannon are working late on the day watch out of Homicide Division when they hear a radio call about a nearby shooting and decide to check it out. They find a woman, Nora Hamlin (Carol Byron), whose husband is barricaded in a room and has reportedly threatened to kill himself. They break in to find him dead, holding a .38 Colt from which one round has been fired. Questioning Mrs. Hamlin, they learn that she and her husband were separated, and she's living in this home with her frail, medicated old mother of 60(! ), Mrs. Gaynor (Mabel Albertson...which would make Nora Donald Hollinger's sister). The next day, our recurring SID man, Ray Murray (Olan Soule), reports that the slug found in Mr. Hamlin was a 9mm, and that he'd been shot in the chest at an angle unlikely for a right-handed man to have done it himself. The detectives go back to the home with Murray and scour the study for evidence. They find that the carpet's been vacuumed, and with Mrs. Hamlin's cooperation, they empty the bag and find the shell. They have little old Mrs. Gaynor brought down, and when they learn that she owns a Luger that used to belong to her husband, they read her her rights. She confesses to how he'd come over drunk the night before, waving his gun around, grabbed the Bible she was reading, tossed it in the air and shot it, and then threw in the in the fireplace. Overcome with a feeling she'd never had before, she pulled out the Luger and shot him. He barricaded himself in the study before succumbing to the wound. The defendant plead not guilty, and not guilty by reason of insanity. The jury found the defendant guilty; however, she was found to have been insane at the time of the commission of the offense. Bozo was a very bad influence. "We were working the day watch out of Copyright Infringement Division...."
Now that would have been really great, if they had gotten teenage analogs of the Mod Squad kids. Ah, Friday and his devastating civility. Well, at least I've got a couple of good years left. he'd been shot in the chest at an angle unlikely for a right-handed man to have done it himself. Do people really commit suicide by shooting themselves in the chest? That seems like a dicey prospect. Overcome with a feeling she'd never had before, she pulled out the Luger and shot him. April 16 – The Rolling Stones release their debut album, The Rolling Stones. The American version of the album won't be released until May 30...but the group's Hot 100 debut will be coming a bit sooner. Is that two that you agree with him about, or two that you disagree? Not that they would've known to do that at the time. I let a lot of such Friday punchlines go without quoting, but this was a particularly good one. Do people really commit suicide by shooting themselves in the chest? That's what I was thinking. I wonder if it had more to do with S&P than anything else. They can convincingly hide a chest wound by having the guy lying face-down. A head wound, you'd expect more of an obvious mess. I also have to question why Mrs. Gaynor had the gun loaded if it was a souvenir sitting in a drawer. I'm not a gun owner, but my understanding is that they require some care and maintenance. If the thing had been sitting untended for years, it would be more likely to misfire. And was the safety off? Unless she was an experienced gun user, if she grabbed the gun and fired it impulsively, you'd think she wouldn't have taken that into account. Going forward, I think Ann would be well advised not to piss her off. So, you cannot tolerate any of Streisand's songs? Not even one? Did he promise to leave the studio if they played with him or something? And there's an example of granny music in the Top 40. Now there's a classic. The Beatles just would not have been the Beatles without Ringo. Disagree. I'm not a big fan of drug addiction. Although, of course, his comment that drug addiction is mind-expanding is prejudicial-- nobody intended to become a drug addict. Aside from that, I don't believe in the supernatural and I do believe in sexual freedom. No? They're running concurrently at this point, aren't they? "I was overcome with a feeling I'd never had before. But I was ready for it. I had been ready for years." Well, there's "Stoney End," but that has more to do with Laura Nyro than Streisand. And "The Main Event" is kind of funny. 28. "Indian Giver," 1910 Fruitgum Co.
Not particularly striking or memorable as the dance songs of the era go. And as Major Lance songs go, it's no "Um, Um, Um, Um, Um, Um". It will be his last Top 20 single, though he'll have another Top 30 later in the year. It's not over for Roy...his biggest, signature hit will be coming our way later in the year. In the meantime, I like the build-ups in this one. There's another all-Beatles recording from those sessions, with vocals, but it will be popping up here as a charting single. And of historical note, "all-Beatles" in these cases means with Pete Best rather than Ringo. They do fall on the Easy Listening side, but The New Christy Minstrels were folk artists. They also helped to launch the musical careers of several musicians, including Kenny Rogers, Gene Clark, Kim Carnes, and Barry McGuire. Our latest British Invader has arrived...although this one falls on the less frenetic side than most of the others so far. Of particular note about Kramer is that, like the Beatles, he was managed by Brian Epstein. And the final single version will be another Walken-approved number. I thought that was the case, but wanted to be sure. Nope...that's the beauty of it. This Dragnet episode was from May 1967. The Mod Squad didn't come along until September 1968. So Dragnet did "The Mod Squad" before The Mod Squad did! Now I'm picturing her practicing with a bullseyed picture of Ann...! Well, it's... a pretty nice song. He's got a lot of years left in him-- but not enough. Unlike "My Bonnie," this one doesn't have a distinctive Beatle sound to my ear. I never would have guessed this was from the same planet as the Beatles. I do remember the name from back in the day, but with no particular context, and that Wiki page rings no bells. And I'm surprised to see Kim Carnes on that list. Interesting. I wonder if there's any cause and effect there, although "mod" and "squad" is a pretty obvious rhyme. Coup plotters (Nehemiah Persoff, Jerry Riggio) have looted a treasury to unseat a South American president (Rodolfo Acosta). Jesus, Rollin's TV Fu chopping in every episode now. It was right in the opening credits this week! Jim gets in a chop of his own as well. The portfolio is back in its entirety...Jim does the unnecessary picking out of the usual suspects and tosses a flyer for "K.D.F. International Auditors" on the pile. Commie "trade representatives" Jim and Cin make President De Varo (Acosta) an offer that would involve them establishing military bases in his country. Floor-Waxing Willy smuggles Barney onto the premises in his cart. While Barney's cutting his way into an emergency escape hatch of the vault (which is supposed to be a one-way deal), Willy stalls a guard by insisting that his floor needs to dry. The guard goes in right after Barney has managed to slip in and put the outer wall back in place behind him, and nobody in the M:I world notices the smell of recently blowtorched metal. Rollin heads the auditing firm, the audit having been called in by the chief plotter, Pereda (Persoff). Pereda also expresses an interest in making a deal with Jim and Cin, letting them in on his plan as he's deduced that they're actually in a position to help him with his coup; but they play hard to get, emphasizing that they're considering a deal with a neighboring country. Barney cracks into other vaults within the vault chamber, takes out some money, then deliberately sets off an alarm. He lets himself be seen by a guard, who's TV Fu'ed by Rollin as advertised, then gives Rollin a pre-planned slug in the jaw to make it look like Rollin was also knocked out by the thief. This puts a kink in Pereda's plan, as he needs people to think that De Varo has embezzled the money, so he has to put the money back in to establish that it wasn't stolen in the theft. As part of the con surrounding this, Cin fake-seduces Auditor Rollin to distract him from Pereda accessing the vault. Rollin disguises himself as De Varo to access the vault (thanks to a recording of the sonic combination that Barney made while Pereda was accessing it) and verify that the money is there. Afterwards, Pereda and his accomplice are in the vault taking the loot back out when Barney, hiding in the escape chamber, sets off a device he'd planted that locks them in. Real Presidente comes to inspect the vault, tipped off by Auditor Rollin, and catches Pereda red-handed in the titular location. This was the show back to doing its usual thing after last week's format-breaker. Decent but not particularly clever, with the fake seduction being an amusing highlight. "Peace Now – Arly Blau"
Arly Blau (Christopher Connelly) is shot by an arrow outside the courthouse while trying to send home demonstrators. A ransom-style note attached to arrow says that his life belongs to his country. Following the incident, in which Arly isn't seriously wounded, he's visited by his father, General George Blau (Ross Elliott), a commander in Vietnam who's really upset about his son's pacifism-informed choices and desperately tries to goad Arly to hit him. Arly's apartment is Fably decorated with Richard Avedon's psychedelic portraits of George and Ringo. Arly happens to be an old school acquaintance of Julie's, so as he proceeds to serve his sentence, she makes visitations. He finds an arrow shaft with another note in his cell, and soon after that his cellmate is attacked and hospitalized. Somehow both Pete and Linc get assigned as Arly's cellmates. Linc makes a show of not getting along with Arly, so one of the conspiring inmates "recruits" him. But Pete is openly friendlier, and gets beaten in the print shop while Arly's forced to watch. While Pete's in the infirmary, Arly and Linc have a talk in the cell about nonviolence vs. justified violence. The chief conspirator turns out to be one of the guards, Carl Haven (Hal Lynch), who served under then-Colonel Blau in Korea. An attempt is made on Arly in the print shop, but Linc fends everyone off. As he's getting beaten, Blau just watches at first, then reluctantly jumps in. Finally driven to commit violence, Arly gets carried away in the moment, and Linc has to stop him from choking Haven to death. Arly then vents his anger at everyone present for being forced to compromise his principles. Julie pretty much disappears from the story once Pete and Linc are on the inside, but comes back for another visitation in the coda, which makes interesting use of each actor's reflections on the glass while the other is in closeup. When the visit's over, the Mod Trio do their walk-off outside the prison; well, more of a hobble-off for Pete, as he's on crutches. I can dig it if you can dig it. For a second there I thought he was going to break into the song! "Not with a Whimper, But a Bang"
A college newspaper editor is the prime suspect in Ironside's investigation of prank bombings. The episode starts on a self-referential note, with Ed giving a lecture at a college in which he coyly drops the names of some colorful guests from previous episodes: "Officer Bobby," "The Macabre Mr. Micawber," and "Sergeant Mike". The small lecture hall is the target of the episode's first bomb threat--Boy, ransom-style notes sure are popping up a lot in the shows lately! The bomb turns out to be a fake--a briefcase that opens to a puff of powder and a pop-up "BANG!" message. Ed Asner being second on the guest list made me suspicious that he'd turn out to be the bomber...particularly as he pops up early as Warrant Officer Frank Simpson, one of a two-man bomb disposal unit working the case, which is a role that wouldn't warrant such a high billing if he wasn't a suspect. The font expert that Team Ironside consults for clues from the notes is played by two-time Trek guest John Harmon. Ironside is on the scene for the next bomb threat and takes care of it himself. Mark gets a good moment when he insists on staying with the Chief. It's another fake, but with a strong enough detonator to have done some injury if it hadn't been doused in water. The third one Eve discovers while working at the school newspaper, sans a preceding note. It's a real bomb except for one detail--the dynamite hasn't been fused. The fourth device is planted at a statue on the campus, and turns out to be the genuine article when it goes off while Simpson is working on it, having been cleverly rigged with two fuses. Simpson is critically injured and soon dies. A difference from the fake treats is discovered: the note connected to that attemp is done in a distinctly different style; the clues implicate the school paper's editor, Neal Morgan (Philip Chapin). He admits to having planted all of the prank bombs, but not the last one. Blow in her ear and she'll follow ya anywhere. Those Laugh-In gags sure are getting around, aren't they? I've been finding Ironside relatively underwhelming, but I have seasons 3 and 4 recorded, so I plan to continue with it in the Fall. I find this one to be pretty good for such an obscuro. A nice change from her recent covers of songs that already had definitive versions by other artists. This one, on the other hand, is a pretty weak outing both for the Supremes and for its writer and producer, Smokey. The Miracles also did a version of it, which I tried but didn't like any better. "The number one song on my personal chart" is a downright cringey lyric. A pity that it didn't make the Anthology. If I had the Photoshop skills, I'd make a shooting target from one of my title card screengrabs. When Friday and Gannon trace a teenage suspect to his home, he runs away carrying a live grenade. This is the city: Los Angeles, California. A lot of it has always been here: the mountains...the deserts...the ocean. Some of it had to be developed, like oil...and water...and the land. The rest was built from scratch. A human mind conceived this [Los Angeles County Museum of Art? ]...and this [abstract sculpture outside]. Man has an instinct to create...or to build...or to improve. But the human mind can go other ways, too. Sometimes it gets lost; then it needs guidance. Reading signs and obeying them can sometimes help a confused mind. They tell you which way to turn; when not to turn; where not to drive; where not to park. In my business, this sign [STOP] means something whether you drive or not. Sometimes, if you don't heed it, you'll see this sign [POLICE DEPARTMENT: CITY OF LOS ANGELES]. I work here. I carry a badge. Friday, October 6 (1967): Friday and Gannon are working the night watch out of Juvenile Division when they get a radio call to go to a theater (that's playing Doctor Zhivago) to investigate an incident involving a youth named Rick Schneiderman (a fair-haired and shirtless Jan-Michael Vincent, credited as Michael Vincent) who had sulfuric acid spilled on his back by the young man sitting behind him, whom he identifies as Gerald Paulson (Mickey Sholdar). The burns aren't too serious because Rick was wearing a jacket. Back at the station, Paulson has been rounded up and they read him his rights--adding an "or any juvenile court proceedings". He seems like an ordinary, mild-mannered kid, and confesses to what he did, explaining that Rick and his girlfriend were making a lot of noise, and that he didn't think the acid--which he happened to be carrying because chemistry is his hobby--would hurt Rick, just damage his jacket. Suppose you'd have gotten that acid in his eyes, boy....Would you have bought him some new ones? Paulson is released to his parents (the Kirsops, his mother and step-father) pending a hearing. Back on Juvenile Patrol, Gannon is giving Friday a talk about how society is making kids grow up too fast when they get a call to the Kirsop home. Mr. Kirsop (Robert Brubaker) reports that Gerald has run away, and shows them the things that the boy has been collecting in his room: a .45 automatic, an M1 carbine, and a pair of hand grenades...one of which is missing from the box. Friday examines the remaining grenade and reports that, contrary to what Gerald had told his stepfather, it isn't a dud. Contacting the vice-principal of Paulson's school, the detectives learn that the boy is known to have social issues and has one friend. Visiting the friend, they learn that Paulson plans to do something before midnight, and that there's a record party being thrown by a girl that Paulson's interested in. Arriving at the girl's home, the detectives are directed to the back patio where they can hear groovy music playing...it's an instrumental, but not the Adam-12 one that will be so popular a year later. Opening the gate, they see all of the partiers on one end of the patio, standing perfectly still, looking toward the other end, where Paulson is holding the grenade with a finger in the pin. In control of the record player, he insists that everyone will stay and listen to the music until he says otherwise. Unable to talk the boy down, Friday notices that he's standing right over an extension cord connection to the record player, and slowly, surreptitiously unplugs it with his feet. The unexpected stopping of the record player offers a moment of distraction in which Friday lunges at the boy and struggles for control of the grenade. He manages to wrest it from Paulson, but the pin is still attached to the boy's finger, so Gannon has to struggle with Paulson over that, and then replaces it while Friday stands perfectly still, clutching the grenade with both hands. On October 23, a hearing was held in Juvenile Court, Superior Court of the State of California, for the County of Los Angeles....As a result of the hearing, the subject was placed under the supervision of the State Department of Mental Hygiene, for treatment as a mentally ill person. This one kind of reminded me of a combination of the first two episodes of last season...a kid with an acid problem, and a ticking clock involving a disturbed person threatening to use explosives. During the scene at the record party held hostage, there was this high-pitched screeching whenever Paulson stopped the record player. I think it was supposed to be a suspenseful bit of soundtrack, but it just sounded annoying to me, like there was something wrong with my set. Friday finds himself in trouble after he kills a man in self-defense and can't find the suspect's spent bullet. This is the city: Los Angeles, California. It sprawls over 467 square miles, and three million people call it home. It's the biggest police beat in the world, and it has fewer policemen per thousand population than any major city in the United States. On paper, one policeman must protect and serve more than six hundred citizens. It's a big job...and a big responsibility. Every police officer carries a gun. Once a month on the pistol range he has to prove he knows how to use it. Someday he may have to. When that day comes, I go to work. I carry a badge. Wednesday, September 17 (last occurred in 1958; I have to wonder if some of these dates are leftovers from having redone stories from the previous iteration of the series): Friday and Gannon have been working very late on the day watch out of Homicide. It's after 2 a.m. when Friday, looking to get a marginal night's sleep, walks to an all-night laundromat near his apartment for cigarettes and sees a man there trying to break into the change machine. His hand on his holstered gun, Friday announces that he's a police officer and the man spins around pulling his own pistol. Shots are exchanged while the suspect manages to make it to the door with the help of some hurled trash bins, getting away with a young female accomplice. The bright trail of fake blood on the floor indicates that the suspect was hit pretty bad. Joe immediately calls it in and two detectives come out, Lts. Bowser (Leonard Stone) and Brooks (future Sgt. MacDonald actor William Boyett). Friday describes the incident to them in detail, but they can't find any trace of a bullet in the wall that the suspect's shot should have hit. The body of the suspect, Arthur Ashton, is found, and his accomplice, Marianne Smith (Anita Eubank), is taken into custody. She claims that Ashton hadn't fired. His gun is found, but it's unloaded and has been immersed in a drum of used oil, leaving no evidence of it having been fired. Friday proceeds to face a board of inquiry consisting of three senior police officers. The testifying detectives have nothing negative to say about Friday's conduct in the aftermath, and offer that Smith's story sounds rehearsed. Nevertheless, the board questions the impact that Friday's long hours may have had on his judgment, as well as whether the gun might have been filled with blanks. By this point things are looking bleak for Joe...he faces the possibility of a trial for manslaughter and being removed from the force. Capt. Brown gives him and Gannon a talk that he out-and-out lampshades as something they'd already know and don't need to hear, about how Friday's badge only means something because of accountability procedures like this. Then the investigating detectives call with a break in the case. Back at the laundromat, they show Friday and Gannon how the bullet had managed to graze the bottom of a wooden wall shelf, leaving a mark that was easily dismissed as one from a pencil while raising the board just enough that the bullet lodged itself in the wall immediately behind the shelf's normal resting place. On Thursday, September 18, the Shooting Board of Inquiry of the Los Angeles Police Department held a final hearing on the shooting of Arthur Ashton....As a result of the finding of the bullet from Arthur Ashton's gun, the Board held that Sgt. 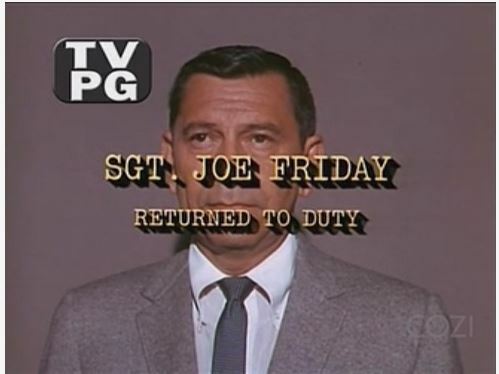 Joe Friday had fired in the line of duty, and that the shooting was within departmental policy. On September 23rd, a coroner's jury hearing the same case also brought in a verdict of justifiable homicide. Marianne Smith was again made a ward of Juvenile Court, and later placed in a foster home. Seriously, they're trying to pass her off as a minor? This episode, of course, is basically the same premise as the later Adam-12 installment in which Reed faces an investigation after a shooting. Continuity point: Friday says that he's "only ever dropped the hammer on a man twice." Given that this was a long-running series in the '50s and a radio show before that, I have to wonder if that assertion would hold up to scrutiny. Friday and Gannon bait the trap for a pair of shakedown artists who pose as vice officers. This is the city: Los Angeles, California. Whether or not you'd wanna live here, it's a nice place to visit. And a few million people do it every year...they come for a lotta reasons. Either way, they don't like to be swindled. When they are, that's when I go to work. I carry a badge. Friday, October 11 (1968--over a year in the future? ): Friday and Gannon are working the day watch out of Frauds Division, Bunco Section, when an officer from Internal Affairs Division brings down a businessman from Iowa named Danhart (Tol Avery) who's been swindled by con men impersonating police detectives. The scam involved having a prostitute waiting for him in his hotel room; the money was ostensibly to post bail for her so that he'd be free to go home on schedule the next day and avoid scandal back home. The way Danhart describes the fake officers makes it sounds like their assumed roles are mirrors of Friday and Gannon--the tough, cynical one and the partner who's a friendlier type. Friday and Gannon stake out the hotel as visitors in an attempt to lure in the suspects, as it would fit the M.O. established by matching crimes in other cities. They get a visit from a man identifying himself as a hotel detective who's looking into reported illegal gambling, who found Gannon suspicious because he was claiming to travel alone but had Friday staying in his room. Friday comes out from hiding, identifies himself and Gannon as police officers, and asks the detective to help maintain their cover. Afterwards, they consider that the detective might be the con men's inside man at the hotel, but decide to go through with their plan. Back at the hotel, a bartender whom Gannon had been working lets him in on the room where the gambling is taking place, and Gannon heads to a phone booth to tip off the house detective. Afterwards, a woman in a nightie and fur coat comes to the door of his room claiming a prowler had been in her room, then acts as if she's going to faint. That's when two men knock on the door claiming to be police. Their M.O. exactly matches what Danhart described--which includes taking Gannon to the Police Administration Building for the fake posting of the bail by one "officer" as the other has coffee in another room with Gannon. Friday tails them to the building and manages to get on the same elevator. Near the coffee room, a couple of other detectives say hi to Friday and Gannon, forcing them to make their move. Friday pulls his gun and informs the impostors that they're under arrest. Danny: I hope we didn't burn anything, Joe. Gannon: No, this was the end of the line, Danny. Danny: You and Gannon must have something the rest of us don't. Gannon: How do you mean? Danny: You make your cases right here in the building now? Friday: No, these two just made a simple mistake. The suspects were found guilty of conspiracy and conspiracy to commit grand theft. Conspiracy in punishable by imprisonment in the state prison for not more than ten years, or by imprisonment in the county jail for not more than one year; or by a fine, not exceeding $5,000; or both. And this one reminded me a lot of "The Bank Examiner Swindle" from last season. I'd been noticing Art Gilmore, who'll play the recurring role of Lt. Moore on Adam-12, as one of Friday and Gannon's department captains. It turns out that he's already played three different department captains at this point, and will be playing more, in addition to two of the ones he's played already reappearing in future episodes...and he'll be putting in at least one Dragnet appearance as Lt. Moore to boot! It's like the Vulcan Neck Pinch. and nobody in the M:I world notices the smell of recently blowtorched metal. The special M:I floor wax masks the smell. While Pete's in the infirmary, Arly and Linc have a talk in the cell about nonviolence vs. justified violence. I wonder if there are outtakes. Yeah, I recorded several, but after watching two of them I am not really inspired to continue. The unexpected stopping of the record player offers a moment of distraction in which Friday lunges at the boy and struggles for control of the grenade. He manages to wrest it from Paulson, but the pin is still attached to the boy's finger, so Gannon has to struggle with Paulson over that, and then replaces it while Friday stands perfectly still, clutching the grenade with both hands. Oh, yeah, I remember this one from when I was a kid. Very tense. I kind of wonder if it's really possible to replace the pin in a hand grenade, but it would be odd for a show like Dragnet to get something like that wrong. Back at the laundromat, they show Friday and Gannon how the bullet had managed to graze the bottom of a wooden wall shelf, leaving a mark that was easily dismissed as one from a pencil while raising the board just enough that the bullet lodged itself in the wall immediately behind the shelf's normal resting place. I remember this, too. One of my all-time favorite moments in Dragnet. And it was so weird to see Friday's mug shot at the end. Society is forcing kids to grow up too damn fast. Friday comes out from hiding, identifies himself and Gannon as police officers, and asks the detective to help maintain their cover. Afterwards, they consider that the detective might be the con men's inside man at the hotel, but decide to go through with their plan. You'd think they would have taken hotel security into consideration in their planning. Their M.O. exactly matches what Danhart described--which includes taking Gannon to the Police Administration Building for the fake posting of the bail by one "officer" as the other has coffee in another room with Gannon. Except that on Star Trek, Spock's usually the only one around who knows how to do that. Whereas the TV Fu chop everybody seems to know! Mod Squad may be light on realistic police procedure, but it's all about bringing the sign-o-the-timesiness. I don't think the timing would have worked out for it to have been a deliberate reference...which doesn't make it any less sign-o-the-timesy. Well, glad it's not just me at least. I kind of wonder if it's really possible to replace the pin in a hand grenade, but it would be odd for a show like Dragnet to get something like that wrong. And it was so weird to see Friday's mug shot at the end. Yeah, I was expecting that after the Kent McCord episode, but it had me grinning. I neglected to mention a cute bit of business at the end of "The Shooting Board"...the detective played by Boyett tosses Friday a carton of cigarettes as a gift and tells him to stay out of trouble. Notably, we never actually see the carton, it's in a brown paper bag. There's a deleted scene somewhere where Rollin is teaching everyone the TV chop. "No, no-- 37-degree angle, one millimeter to the left of the carotid." Good to know. There's a similar scene in M*A*S*H and now I can rest comfortably knowing that both are accurate. Kind of like a Life Savers commercial for people with lung cancer. Do you mean he pronounces it "ro-DAY-oh" like Rodeo Drive in Beverly Hills, or "RO-dee-oh" like Rodeo Road in Los Angeles? Rodeo Drive in Beverly Hills; didn't know about the other one. It came up before with Julie in a rodeo-set episode of The Mod Squad. More than most TMS episodes, this, the penultimate story of its debut season, was hitting the audience over the head with the generation gap themes. Not really memorable, or a particularly strong story. Nevertheless, the board questions the impact that Friday's long hours may have had on his judgment, as well as whether the gun might have been filled with blanks. So, Friday almost lost his career because he had to go for cigarettes. This almost warranted a 4th wall breaking lecture from Webb talking to the audience about the dangers of smoking, but we know that was not going to happen on a production from smoking-like-a-freight-train Webb. ^ Was there any doubt? He was a cop in late 60s Los Angeles; he could have burned down a school (probably with a cigarette), and the board would have found him innocent.